This card is for my best friend who also makes cards, so I needed it to be special for her, I hope she likes it. I have used a 8 x 8 card and used a 8 x 8 spellbinders embossing folder. I then used a bit of ink and gilding wax to show the embossing off. I also used the Grand Nestabilities and layered them, I have also used small rosebuds and a very old photo for the center. I have learnt so much from watching Christina's video's as I only started making cards 6 months ago, and I now get regular orders after doing a craft fair. 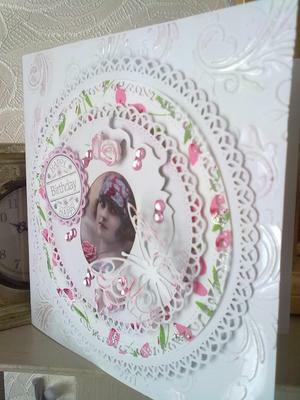 This card is beautiful and your friend will be delighted with it too. You have made it extra Special and I am sure it will take pride of place on her mantleshelf. Spellbinders are such a wonderful addition to any crafters "Stash" and they will enhance any project that they are used on. I'm sure your friend will be delighted to receive it.